Housed in some 500 glass bottles stacked on metal shelves, the water, sediment and vegetation samples on display in the window of 1700 L St. NW look like a science project. 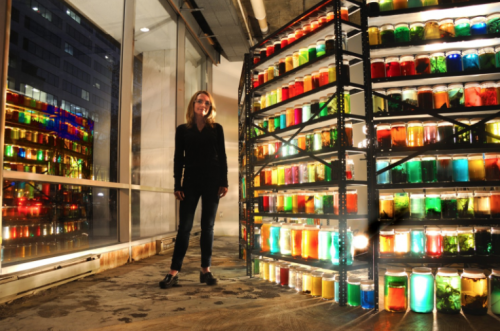 But the contents of the jars, illuminated from behind, also glow with vivid reds, purples and blues, resembling a color-field painting that has been disassembled and liquefied. “Green Room” is both science and art, explains its creator, Julie Wolfe. The D.C. resident began as a painter, but she wants viewers not just to appreciate the colors of “Green Room” but also to ponder the threats to the world’s water supply. The piece, as well as being a collection of what Wolfe calls miniature landscapes, is “some sort of vision of what’s to come in the future,” she says. Many of the installation’s samples came from the Anacostia and Potomac rivers and Rock Creek, but Wolfe also collects water on out-of-town trips. (There’s melted New York snow in the mix, for example.) Recently, the artist assembled a small “Green Room” in Berlin, using that city’s waters and jars that had been packed with sausages. The colors that develop in the bottles derive from extracts and chemicals that Wolfe adds, but they’re not chosen simply for their ability to produce vivid hues. Many of them, including henna, squid ink, beet juice and cochineal-bug essence, are of natural origin. Others are chemicals often added to water, such as copper sulfate, which kills roots that grow into underground pipes, and rhodamine 6G, a fluorescent dye used to chart the speed and direction of water flow. With its steel shelving and factory lighting, the piece has what Wolfe calls an industrial, clinical feel. But the metal and glass are the only unchanging elements. The colors are a passing phenomenon of water and light, both transient substances. And the vegetation can either decay or thrive, bolstered by the heat from the lights and the air that moves through tubes linking some of the bottles. A few of the water samples were recycled from two smaller arrays in Wolfe’s 2013 Hemphill Fine Arts show, “Rewilding.” They’ve been around, but they won’t last forever. Where classical painters and sculptors aspired to reveal and create eternal beauty, Wolfe is one of those artists who is okay with decay. Some artists and musicians use aleatory (from the Latin word for dice) techniques that surrender much of the decision-making process to chance. Wolfe controls the initial process but then hands the dice to nature. After choosing the ingredients of “Green Room,” she lets biological processes alter them. This carries over to Wolfe’s painting, which is partly inspired by her work with water and aquatic plants. Recently, she has been painting on X-ray film with algae, combined with binders or oil paints. Even with those additions, it’s not the most permanent of media. All installation artists recognize that their work is temporary, even if it has a long-term lease. “Green Room,” however, won’t simply be disassembled. Wherever the bottles go, their contents will continue to change. The piece is a bit like a portable swamp, with rotting grasses and bubbling methane divided among more than 500 bottles. “My favorite thing is how repulsive they get over time,” Wolfe says with a laugh. What will endure are the concerns “Green Room” raises. Wolfe enjoys talking to people who stop by when she’s at the site, many of whom deal with water issues professionally as scientists, economists or political activists. Passersby know about, or want to know more about, the processes that turn water into a rainbow of natural and unnatural hues. “Green Room” is the third in a series underwritten by the building’s owner, Lenkin Co., and managed by Hemphill Fine Arts, a D.C. gallery. It’s usually viewable only from outside but will be open for a performance by local experimental musician Emily Francisco on Thursday at 7 p.m. (Doors open at 6.) Francisco sometimes employs water in her concerts, but this piece will involve deconstructed music boxes.